Edward Bok said, “Wherever your lives may be cast, make you the world a bit better or more beautiful because you have lived in it.” One way we can do this is to help save rare species so future generations can discover their uses and their beauty. The Rare Plant Conservation Program is an expression of Bok Tower Gardens’ conservation mission and works to conserve and enhance our understanding of Florida’s rarest native plants. 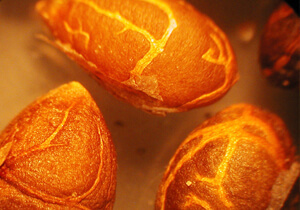 When a rare plant population is being impacted by development or other activities, the Rare Plant Conservation Program helps prevent loss of its unique germplasm by collecting seeds or living plants. Rare plant rescues have been performed throughout Florida as a cooperative effort between government agencies, private companies and landowners. Rescued plant material becomes part of the National Collection. Very little is known about the rare and unique flora of Florida, making research critical for preservation efforts. 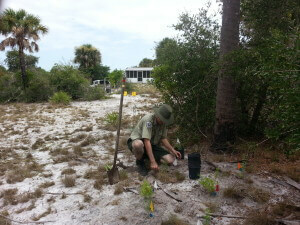 Our collaborative research with organizations and universities help us learn more about Florida’s rare plant species. These research projects gather important information on optimum seed storage parameters, improve germination rates in trials, develop propagation protocols, study population dynamics, improve success in tissue culture propagation protocols, and study population genetics. We also develop methods for establishing and monitoring rare plant populations. The Rare Plant Conservation Program maintains and strengthens a network of conservation partners working together for plant conservation. Involvement in a global network includes our membership with Botanic Gardens Conservation International and nationally through coalitions such as the CPC. Bok Tower Gardens participates in cooperative projects with government agencies, universities and research institutions, conservation organizations, and private landowners. With funding from the State of Florida, we collaborate with Fairchild Tropical Botanic Garden to host the annual Rare Plant Task Force, which brings together Florida’s conservation professionals to share research findings, exchange information and increase networking opportunities. Our educational activities help foster an appreciation and understanding of Florida’s unique flora. These activities include supporting student research projects and providing information to the public through published articles, tours and presentations. The Endangered Plant Garden provides a one-of-a-kind opportunity for visitors to see some of Florida’s rarest plant species. Collaborating with the U.S. Fish and Wildlife Service and other project partners, we use data gathered from research projects to inform efforts to introduce new populations of endangered plant species onto protected lands. When suitable lands are located within the right habitat, soil type, and historically known range of the species, an introduction plan is outlined based on biological information available for each species. Plants are propagated in the greenhouse and tagged with permanent numbers before being introduced into their new location with the help of volunteers. 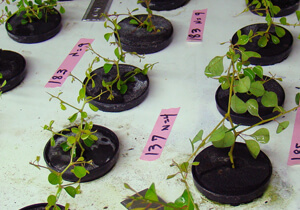 Number tagging allows tracking of the long-term survival, growth and reproductive status of the plants. For more information about Bok Tower Gardens’ conservation efforts and how you can get involved, contact Cheryl Peterson, Conservation Program Manager, at 863.734.1220, or e-mail cpeterson@boktower.org. Affiliated with the National Center for Plant Conservation in St. Louis, MO, Bok Tower Gardens’ Rare Plant Conservation Program was started nearly 30 years ago and has partnered to conserve Florida’s rarest plant species. The program’s conservation efforts have been directed at rare plants in their natural habitats (“in-situ” conservation) as well as in Bok Tower Garden’s nursery (“ex-situ” conservation.) The nursery has been able to grow many of central and north Florida’s globally endangered rare plant species – plants that grow in a few locations in Florida and no where else in the world. 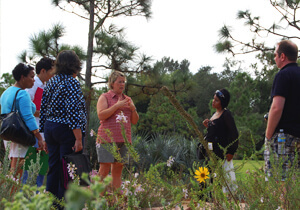 The rare plant conservation growing beds have provided staff and other Florida and Federal agencies with research and educational opportunities, but public access to the nursery has been limited to tours by appointment only. Interest in seeing and learning about these rare plants has increased over the years as the public has become more aware of the environment in general and the uniqueness of Florida’s natural habitats.